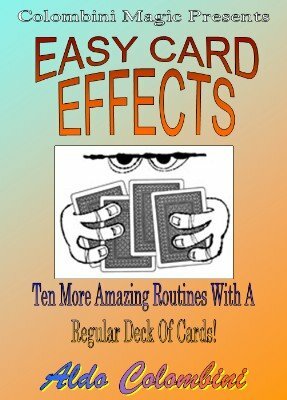 Ten more amazing routines with a regular deck of cards. VALUE/SUIT PREDICTION (Nick Trost): A spectator shuffles the deck, yet you reveal a selected card. FATE IN NUMBERS (Karl Fulves): A die and a deck of cards. A spectator picks two sides of the die and you deal two packets. The top cards reveal the numbers of the die. VANTAGE POINT (Rachel Colombini): A FREELY selected card is revealed with a comedy spelling (or, in a second routine, with an elimination process). Clever method. SUNRISE (Aldo Colombini): Two Kings are left on the table. The other two find two selections and they turn out to be the other two Kings. The tabled Kings are now the selections. CALCULATOR CARDS (Richard Himber): An entertaining routine where you find the selection, 6 and 3 quarter cards in down the deck. You will use it. FLIP SANDWICH (Aldo Colombini): Two Kings are placed in the deck and a card is selected. The Kings flip face up trapping the selection. TWISTING HOFZINSER (Nick Trost): An easy variation of a classic. The four Aces turn face down one at a time and the Ace of the same suit as the selection turns into the selected card itself. A VOLATILE CARD (Karl Fulves): A spectator picks a card and you show that you predicted that card. Then the whole deck changes color. MATH ACES (Henry Christ): Using freely selected numbers you produce the four Aces. PERMISSION TO LIE (Werner Miller): A funny approach to the Lie Detector theme.